The very word conjures up a vision of towering minarets and ancient mosques clustered together in a small medieval walled town in the midst of golden desert sands. Khiva. Don’t you agree? The reality, even after centuries, is no different. 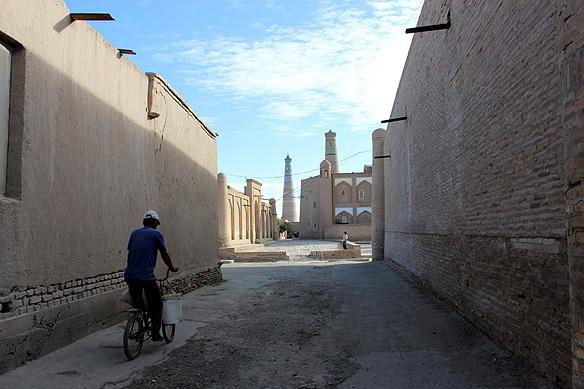 Khiva was once a major trading post on the Great Silk Road in Central Asia. Traders from Iran, India and the banks of the river Volga in Russia, to those leaving for the Near East, Turkistan and China converged here. There were direct routes to Mongolia and Eastern Europe from its crossroads. Much like a medley of intertwined branches, the Silk Road was not one single path, but many crisscrossing the expanse of Europe and Asia, stretching from Rome to Nara in Japan. The “road” opened in 130 BC when the Han officially opened trade with the west, and closed in 1453 AD when the Ottoman Empire boycotted trade with them. But it was not just all about trade; it was also the exchange of culture, religion, beliefs and ideas. Within this kaleidoscope of space and perspectives, Khiva blossomed as a gathering point, its squares and alleys bursting with haggling merchants and goods changing hands. The din of vibrant conversations and sporadic friendships still echo in its clay brick-faced walls. Whilst all those years ago, it was the traders, today it is travellers from across the globe who gather in the chaikhanas and the shade of the courtyards. If the first chapter of the Khorezm province is about Uzbekistan’s Zoroastrian roots, the second is a testimony to the Arab conquest and its subsequent magnificence as Khanate of Khiva. Inspired by a dream of 300 burning torches, Biblical Noah’s son, Shem, is credited with the founding of Khiva. After building the walls of the city, Shem went on to dig the “Kheyvak” well which still stands inside its walled city, Ichan Kala. 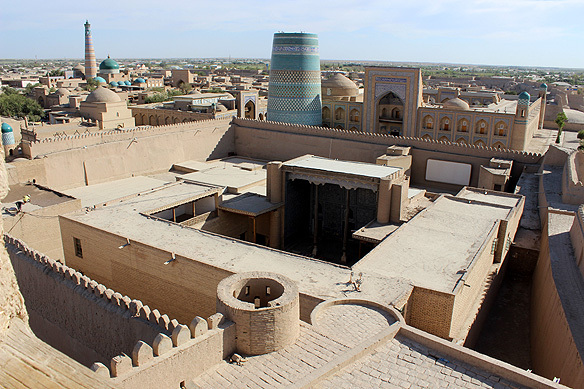 Starting off in myth, Khiva grew from being a small Zoroastrian town to a trading hub on the Great Silk Road, to finally become the capital of the Khanate of Khiva in 1598. The Khanate was a Central Asian state (1511 to 1920) ruled by descendants of Genghis Khan. Along with its rise in political prominence came an indigenous architectural style characterised by majolica facings, columned ayvans or terraces, and wood, marble and alabaster plaster carvings, setting it apart from others. Add to these narrow streets and dead-end alleys, and we end up with a small town straight out of a fabled tale, expecting Alladin to pop into the frame any minute. Sorry, there is no Alladin, but Khiva’s legends are no less fantastical as I was to soon discover. The “museum city” is replete with Sufis, flying architects and pakhlavans [athletes] bringing defeated contenders from Multan [my ancestral hometown] to this city. The poker-faced entrance of the Tash-Khauli Palace. It is a different story inside the palace walls. Majolica facings, carved wooden pillars and painted ceilings create a riot of geometric designs, ranging from the intricate to the monumental. 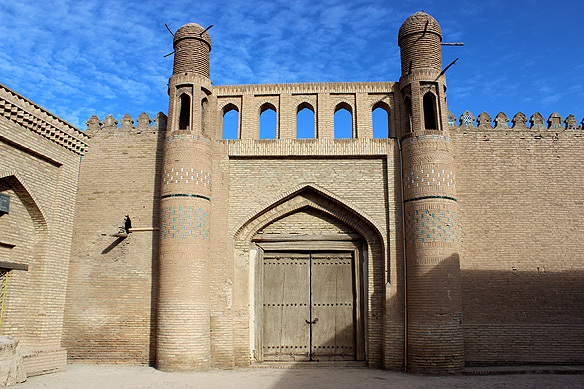 Within the 10-metre high, 8-metre thick, 2,200-metre long 5th Century clay walls of Ichan Kala or the inner city are the poker-faced fortified palaces [old and new] of Khiva’s rulers—the Khans. Nestled further inside these high walls are majolica faced reception rooms, administration offices, harems and mosques wrapped around airy courtyards. It was enough to take my breath away: for one, I didn’t expect to see so much splendour packed into a singular space, and secondly, the rapidity of its presence at the end of a narrow dark corridor comes as a shocker—a lovely bolt from the blue, literally. 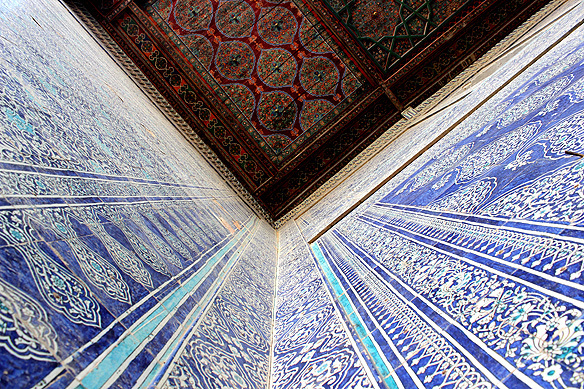 There are two such palaces inside Khiva. Kunya-Ark [the old fortress dated 1686-88 and added to over the years] and the newer Tash-Khauli [Khan Allakuli’s palace built in 1830-38], both complete with their fair share of tales and tiles. One, full of gory detail, recounts that the best architects of the 19th Century were executed on the Khan’s orders whilst building Tash-Khauli, the “stone country estate”. This was because they could not build the demanded 150 rooms in nine extensions over the stipulated two years. It was a cruel world even then. The Harem in the Kunya-Ark, the old fortress. 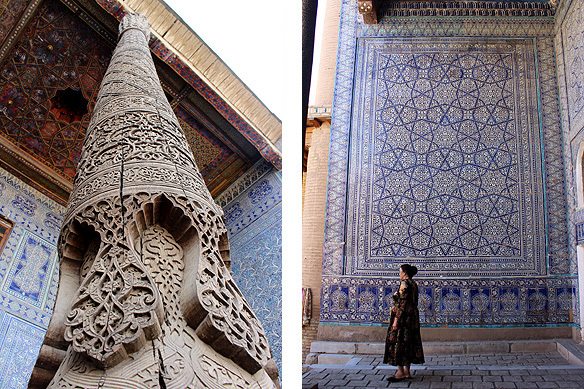 The 212 pillared cathedral mosque of Khiva. 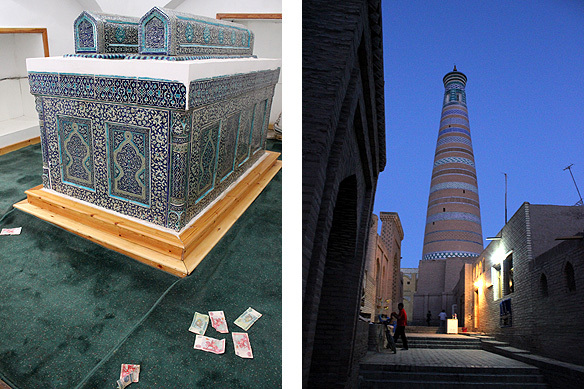 Like any other medieval Islamic city, Khiva too bursts at its seams with mosques. Some have fallen into disrepair. Some left as active places of worship through the trials and tribulations of time. But it is something else that stands out. For the first time in my rather lengthy travel experience I saw young teenage [Uzbek] girls in tank tops and cropped jeans do their namaz at a shrine, and more significantly, it was ok, for all concerned. Slowly, I began to understand the distinctive legacy of this country—a heterogeneous mix of Zoroastrianism, Russian atheism and recent return to Islamic roots. A reflection of Khiva’s peculiarity, albeit on another note, is the Djuma Mosque or Cathedral Mosque. There is nothing quite like it anywhere else. Constructed in the 10th and 18th Centuries as per varying sources, the one-storied flat-roofed structure, covering an area of 55 X 46 metres, is devoid of porches, arches, domes or decoration. 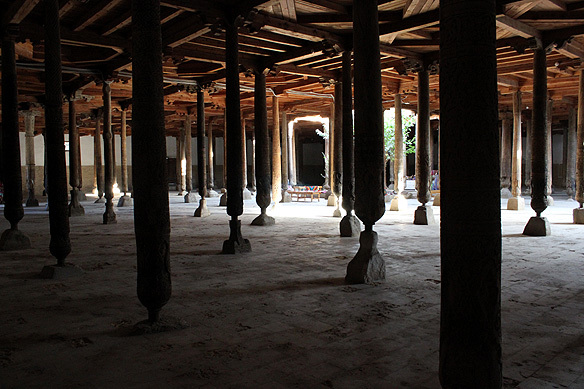 But what it does have in plenty is wooden columns—212 in all, with each one distinctive in design, form and size. Twenty-five of them go back to the 10th-16th Centuries. Where there are mosques, there are mausoleums and madrasahs. Khiva’s most ancient architectural remnant is the Sufi saint Sheikh Seyid Allauddin’s mausoleum dating back to his death on 18 March 1303. 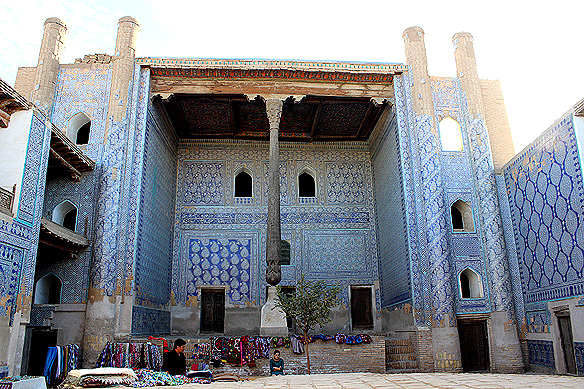 Khiva’s most popular shrine locally is the Pakhlavan Mahmud Mausoleum (18th-19th Century). The latter was built in honour of Pakhlavan Mahmud (1247-1326), the sacred patron of Khiva who was a poet, furrier, philosopher, healer, and athlete. He is called the Khoresmian Omar Khayyam, and wrote over 300 Ruba’is on love and philosophy. 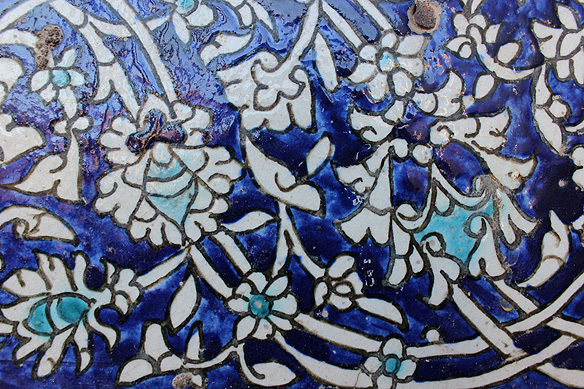 Writing under the pseudonym of Piryar-Vali, none of his works survive except those written on the walls of his tomb. Mahmud is also the one who visited Multan and brought back a group of my ancestors as his booty to Khiva. The Khan’s deceased family members are buried next to the mausoleum. When it comes to grandeur, however, the Muhammad Amin-Khan Madrasah (1851-54) wins hands down. With 125 khudzhras [cells] housing 260 students, it is not only the biggest medieval madrasah in Khiva, but in Central Asia. Today, it is a hotel. Left: Tomb of sufi saint Sheikh Seyid Allauddin; Right: Picture perfect Islam Khodja Minaret. Yes, minarets come in all shapes and sizes in Khiva, and the most beautiful of them is the one right in front of my hotel room window. No, I am not biased. The Islam Khodja Minaret is part of the Islam Khodja complex consisting of the smallest madrasah and highest minaret in Khiva. At 57 metres high, the minaret was built by Islam Khodja, the chief vizier of the Khivan Khanate in 1908-10. Khodja was eventually murdered for his innovative policies and leaning towards Russia. In contrast, Djuma Minaret is the plain Jane. 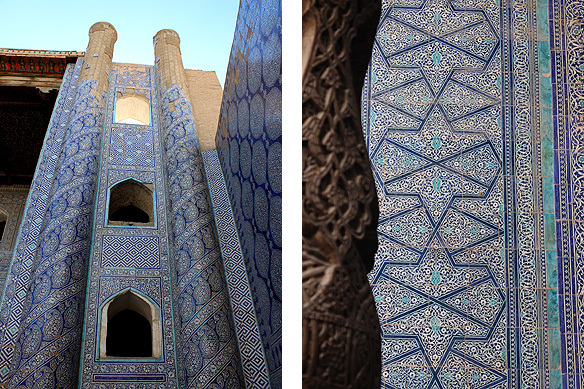 It is also one of the earliest in Khiva—18th Century—at 32.5 metres high and seven rows of turquoise bricks as its only decoration. But the one which everyone associates with the city is the Kalta-Minor Minaret or Short Minaret. Just another alley in Khiva. It was also now time for me to leave again. My next stop was Bukhara. Walking over the ramparts of the ancient city walls as the sun set, all of Khiva spread out in front of me—intimate, golden, timeless. I wondered what Bukhara would be like. And with that thought, I turned back to my hotel room to dig into the Khiva version of pilaff with beef chunks piled high on cotton seed oil cooked rice. The Khodja minaret across the street called out “Salomat bo’ling” [goodbye] and like the traders of old, I too left, having found a friend. Pilaff for dinner. 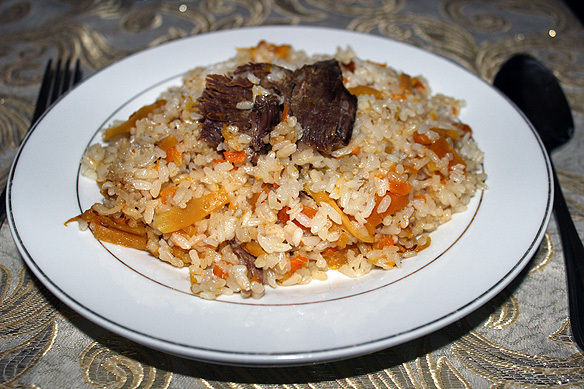 There are 1,200 recipes of the Uzbek national dish; Each town has its own version. Note: Khiva was part of my road trip from Nukus to Tashkent in Uzbekistan last year. This entry was posted in Exploring our World, Uzbekistan and tagged Djuma Mosque, Genghis Khan, Great Silk Road, Ichan Kala, Islam Khodja Minaret, Kalta-Minor Minaret, Khanate of Khiva, Khiva, Khiva Architecture, Khorezm, Kunya-Ark, Majolica Tile, Muhammad Amin-Khan Madrasah, Museum City, Pakhlavan Mahmud Mausoleum, Pilaff, Sheikh Seyid Allauddin, Shem, Sufism, Tash-Khauli, Things to see in Uzbekistan, Uzbekistan Tourism by Rama Arya. Bookmark the permalink.